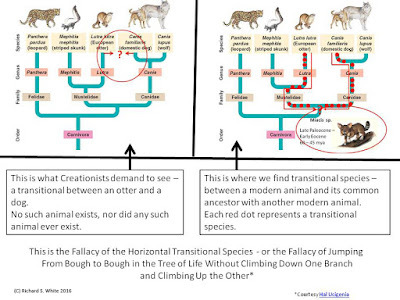 Otherwise known as the fallacy of jumping from bough to bough in the tree of life without climbing down one branch and climbing up the other, the Horizontal Transitional Species Fallacy is one of the most frequently repeated errors in much of Creationism's internet presence. How many times do we see demands from Creationists to see "one kind giving birth to another kind". They demand to see a dog turn into a cat, or a cow turn into a whale, or even a crocodile turn into a duck - Kirk Cameron and Ray Comfort's famous Crocoduck, which is what they imagined we would have to produce if evolution was a valid theory. 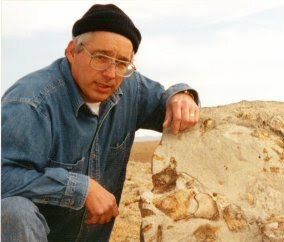 So bizarre was this claim that famed Internet YouTuber Potholer54 (Peter Hadfield), actually hosted the Golden Crocoduck Awards (2008 - 2013) for the most outlandish Creationist claims of what evolution is about. In spite of the efforts of almost every supporter of evolutionary biology who participates in various internet venues like Facebook and YouTube, Creationists continue to push this fallacy, for two reasons, I believe. First is that it is an easy shot - "Show me a cat giving birth to a dog!" - just a few short words, and their base is energized. Second, it makes those of us on the side of rational thought stop, shake our heads and ask ourselves "Do we really want to go through this AGAIN?". There are no transitionals between living species. Evolution does not predict that there are. In fact, were a cat to give birth to a dog, evolution would be dealt a serious blow, if not killed outright. Remembering that modern species are each the product of a lineage of species going back in time, we can use the Tree of Life as a metaphor to demonstrate the irrationality of what Creationists are asking for. 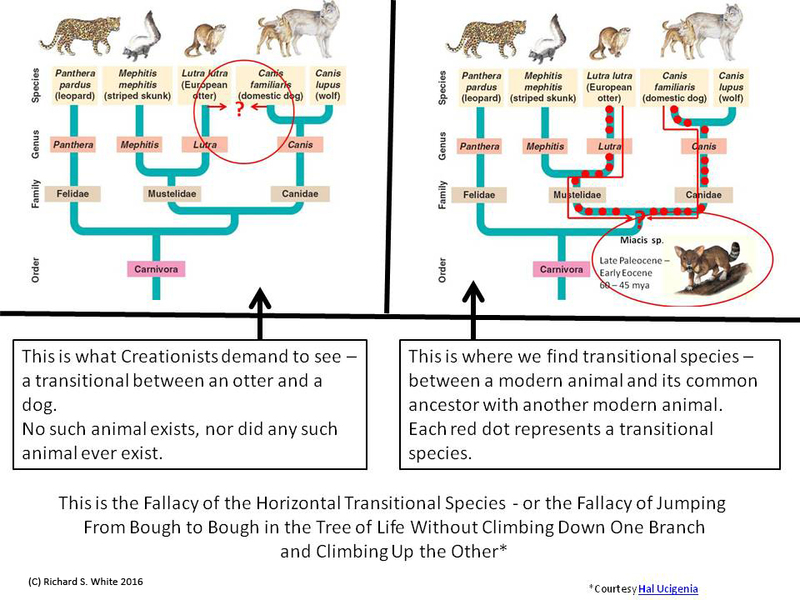 I've attached a graphic, adapted from a slide in Peter Chen's set of graphics for Biology 1151 Principles of Biological Science (found here: bio1151b.nicerweb.net) which illustrates the difference between what Creationists seem to think a transition should be, and what evolution say it actually is. In this example, a Creationist might ask to see an otter giving birth to a dog, or a dog giving birth to an otter. This is illustrated on the left hand side of the graphic. Notice that there are two limbs of the tree involved - the limb we call the family Mustelidae, which consists of the skunks, weasels, otters, badgers and other similar carnivores, and the limb we call the Canidae - the wolf, jackal, fox and others. Creationists want us to jump from the otter directly to the domestic dog. But what evolutionary theory really says is that these two modern animals have a common ancestor that they share with no other living animal. That common ancestor was a species of the genus Miacis, which lived in the Early Eocene, between 45 and 60 million years ago. The actual common ancestor may not be a known species or even genus, but Miacis is the closest thing to the common ancestor which we have found, identified and described. There is a whole series of transitional species between the domestic dog and that species of Miacis which is, or stands in for, the common ancestor with otters. There is also a whole series of transitional species between the otter and that same species of Miacis. Thus, as illustrated on the right side of the graphic, to get from the otter to the dog, one must climb down the bough that is the Mustelidae until you get to the common ancestor, and then climb all the way back up a different bough, the Canidae, to get to the domestic dog. Evolution is a branching pattern, a set of nestled hierarchies. There are no straight line horizontal connections between living animals on separate branches. There are two sets of transitionals, one from the otter to the common ancestor, and one from the domestic dog to the common ancestor. Thanks to FB member Hal Ucigenia for the wonderful phrase "jumping from bough to bough in the tree of life without climbing down one branch and climbing up the other."